There once was a time when Jim Hoft, aka the Gatewaypundit, was widely respected across the conservative blogosphere. That’s in the past and getting further into the past with each and each post. For instance, Jim never would’ve written, much less published, this post. At one point, Jim was part of the post-Breitbart crew. Like other post-Breitbart ‘celebrities’, the quality of Jim’s writing has gone downhill, in my opinion. This post is an example. I’ll say this: what the billboard lacks in credibility, it makes up for in desperation. I hope Jim contacts us if he returns to putting a priority on emphasizing reality. This weekend, Sarah Palin said that Paul Ryan’s political career was essentially over. Mrs. Palin predicted that Ryan was about to be “Cantored”, a reference to former House Majority Leader Eric Cantor, who was defeated in a GOP primary. At the time, I said that Mrs. Palin had started believing her press clippings a little too much. People know me really well in Wisconsin, they know I am going to stand up for my principles that are conservative principles no matter how popular that may be on a given day. They know me personally very well. I don’t really worry too much about outside agitators. Mrs. Palin is a fading star in the GOP. Though she’s still got a following, that following keeps getting smaller and closer to the political fringe each time they make an appearance. It won’t be long before she’ll be a footnote whose fifteen minutes of fame ran out of the hourglass. Let’s be blunt about a couple of things. 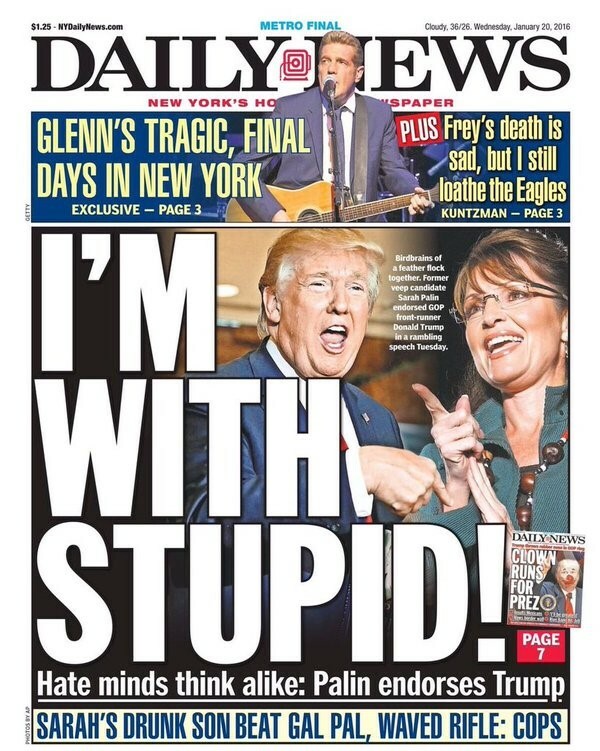 First, Sarah Palin has said so many foolish things that she simply isn’t respected by mainstream Republicans. And when I say mainstream Republicans, I’m not talking about the GOP Establishment. I’m talking about the hard-working GOP activists that volunteer countless hours building the Republican Party only to watch crackpots like Donald Trump and Sarah Palin tear it apart. 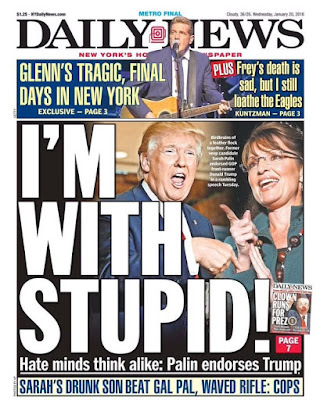 Second, Mrs. Palin’s stupidity was highlighted when she predicted Speaker Ryan’s defeat. 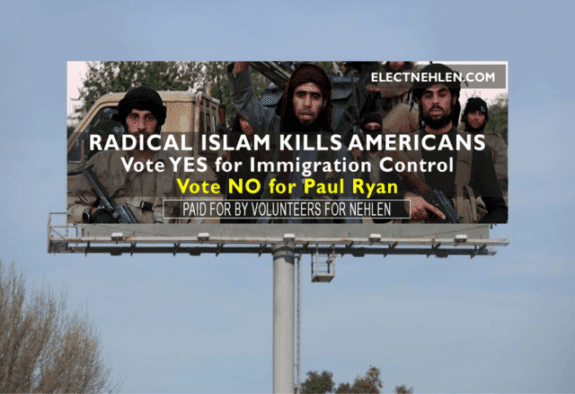 RightWisconsin noted that “The last Marquette University Law School Poll showed Paul Ryan had a 76 percent approval rating from Wisconsin Republicans.” When Cantor lost his primary, voter discontent was widespread. Voter discontent for Speaker Ryan is virtually nonexistent in Speaker Ryan’s district. It wasn’t a positive impression. When Sarah Palin first burst on the scene in 2008, she burst onto the scene in a big way. Since then, she’s fallen like a meteor from the sky. Here in Minnesota, Palin’s star started falling when she endorsed a liberal Republican for the US Senate race against Al Franken. Now she’s falling again by abandoning logic in supporting Donald Trump. When Palin endorsed Julianne Ortman, I asked Palin if “a politician who won’t repeal Obamacare, who’s proposed raising taxes and who’s voted for Cap and Trade was ‘a conservative champion'”? I think I would rather have a president who is tough and puts America first than win a game of trivial pursuit. I don’t know if other candidates were posed the same question, I don’t know if they have the answers. I don’t think the public gives a flying flip if somebody knows who, today, is a specific leader of a specific region because that will change. Of course, when the next president comes into power, based on the volatility of politics in these other areas. I don’t think the public is concerned about that. It’s kind of subjective, too. Whether a candidate is worthy to be given attention, and respect and be taken seriously if they don’t know the leader of some — religion, even a country. How about other candidates who may not know the price of a barrel of oil today, or how much oil it is that we are importing from foreign nations, unfriendly foreign nations and we have a ban on exporting our own oil and prohibitions and bans on drilling for our own oil. Details maybe involved in that that a candidate doesn’t know. Hey, I’d be subjective and say, if you don’t know that, you’re not worthy of being taken seriously, Mr. Candidate. Ms. Palin, other candidates have been asked the same questions by Mr. Hewitt. They’ve passed with flying colors. Mr. Trump failed miserably. Now he’s making excuses. As for whether “the public gives a flying flip,” that’s irrelevant. It’s important that the next commander-in-chief a) know the major terrorists on the world stage and b) better have a strategy to eliminate them starting on Day One in the Oval Office. It’s disgraceful to characterize Mr. Hewitt’s questions as Trivial Pursuit questions. They weren’t questions about obscure leaders of countries that don’t pose a threat to the United States. Hewitt’s questions were about the leaders of the biggest terrorist organizations on the planet. Saying that “I’ll hire the next Douglas MacArthur” isn’t a strategy. It’s a worthless prediction. As for “candidates who may not know” “how much oil it is that we are importing from foreign nations,” I suspect that list is tiny. Sarah Palin once was a rising star in the GOP. These days, she’s just another pundit who doesn’t do her research. So why should the Barack Obama administration continue to drag this “good for the USA” project out after six years of review and a recent Nebraska Supreme Court ruling paving the way on a local level for the pipeline? We see no reason other than the president being controlled by the far-left environmental wing of the Democratic Party that is so far out of step with the vast majority of Americans that you need some powerful binoculars to even find its members. Let’s be blunt. The environmental activist wing of the Democratic Party isn’t just out of step with “the vast majority of Americans.” It isn’t that you’d “need powerful binoculars” to see these activists from America’s political mainstream. And we would also like to hear what both Sens. Klobuchar and Franken think about what the anti-Keystone zealots say about the thousands and thousands of construction jobs that would be created by the pipeline. The people that make up the environmental activist wing of the Democratic Party will never get asked difficult questions by politicians like Sen. Klobuchar and Sen. Franken. That’s because politicians like Sen. Klobuchar and Sen. Franken know that environmentalists are significantly more reliable Democrat votes than construction union members are. Members of the local pipefitters or other unions sometimes meander away from the Democratic Party. Politicians like Sen. Klobuchar and Sen. Franken know that. They also know that environmental activists vote for Democrats almost as reliably as journalists or trial attorneys. Private sector union workers don’t. McConnell defeats Bevin; death of the TEA Party? Thankfully, the GOP primary in Kentucky is history. I’m thankful because I won’t have to hear that Matt Bevin is the TEA Party-backed candidate. Articles like this one will disappear, which, by the way, is terrible news for Alison Lundergan-Grimes. More on Lundergan-Grimes in a minute. They pointed to an exaggeration of his educational credentials on his LinkedIn page and apparent previous support for the financial bailout as evidence. And Bevin wasn’t helped by a series of high-profile unforced errors, at one point suggesting that legalizing gay marriage could lead to parents being able to marry their children and speaking at a pro-cockfighting rally that he said he was unaware was related to cockfighting, and then later backtracked on that statement. Simply put, TEA Party organizations haven’t done a good job vetting candidates before supporting them. Candidates that think gay marriage will lead to wierd marital relationships isn’t qualified to run for the state legislature, much less run for the US Senate. That isn’t to say I’ve suddenly ‘gone establishment’. I still passionately believe in the founding principles of the TEA Party movement. I believe as strongly today that TEA Party principles are the remedy for this nation’s ills as when I was organizing TEA Party rallies. This year especially, I’ve been disappointed with some of the TEA Party’s endorsements. I didn’t hesitate in criticizing Sarah Palin for saying that Julianne Ortman was “a conservative champion” at a time when Ortman was enthusiastically telling Minnesota media outlets that she opposed full repeal of Obamacare. It’s time that the so-called TEA Party leaders did their research before shooting their mouths off. It’s time they started picking candidates that don’t tie themselves into knots on the most basic of questions. The point I’m making is that the TEA Party shouldn’t feel obligated to run a candidate in each of the races. If the so-called TEA Party candidate is a terrible candidate, the TEA Party shouldn’t endorse a candidate in that race. It’s time for the TEA Party to take that next step. It’s time they started picking top-tier candidates who won’t fall apart like Mr. Bevin did. Until they do a better job of candidate screening, they’ll continue losing races they could’ve won. The letter comes after a few days’ worth of news reports and speculation about some willingness to raise taxes within the GOP Senate caucus, whether it be by broadening sales taxes, eliminating tax breaks, or other means. Taxes Chair Julianne Ortman was at the center of the speculation after she made comments calling tax expenditures government spending. Ortman has told us in the past that she fully intends to review and eliminate some tax breaks, although she disavowed any express wish to raise total revenues. She also mused favorably about how some states have been able to broaden sales taxes and lower rates. At the time, the House and Senate GOP caucuses were saying that they were committed to balancing the budget without raising taxes, which they accomplished after Gov. Dayton shut down the state government for 2 weeks. First, Sen. Ortman’s proposal was terrible policy because it didn’t do anything to fix out-of-control DFL spending increases. Giving the DFL additional revenue is like putting out a fire with a little extra gas on the fire. Secondly, when Sen. Ortman went rogue, she did so without telling her colleagues. That’s the fastest way of stabbing her colleagues in the back. It was her way of saying that her priorities were more important than her colleagues’ priorities, that her priorities mattered and that their policies didn’t. When Sen. Ortman went rogue, House and Senate GOP leadership were in the process of negotiating with Gov. Dayton, Sen. Bakk and then-Minority Leader Thissen. Her proposal cut the legs out from under the GOP leadership. The lesson to be learned from this is that Sen. Ortman a) isn’t a team player, b) isn’t “a conservative champion” and c) can’t be relied on to do the right thing in holding down taxes. Minnesotans don’t need someone who will fit right in with the DC Surrender Caucus right alongside John McCain and Lindsey Graham. We need someone principled who will fight for smart policies that grow the economy, create jobs and make Minnesotans’ lives better.